A Balanced Approach to Immune System Health! Healthy aging requires a dynamic immune system. A youthful body is dependent on balanced immune-cell activity to maintain effective, responsive, and modulated immunity. Extracts from the white peony root have been used in China for immune balance for more than 1,200 years. Modern science now recognizes the immune importance of a bioactive peony extract component called paeoniflorin. 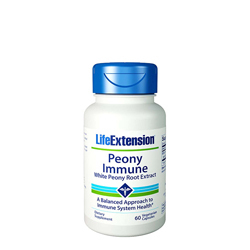 White Peony Immune Root Extract , by Life Extension Foundation, is a standardized extract of active white peony compounds that have been shown to help maintain the balanced responsiveness, sensitivity, and strength of a properly-modulated immune response. Through a host of subtle mechanisms, Peony Immune Root Extract promotes immune homeostasis—optimal immune health—by limiting production of inflammatory molecules and naturally balancing inflammation-suppressing cells and pro-inflammatory cells. A host of human clinical trials have demonstrated that the compounds in Peony Immune Root Extract promote a healthy and balanced inflammatory response. Suggested Usage: Take one capsule twice daily with or without food, or as recommended by a healthcare practitioner. Warning: KEEP OUT OF REACH OF CHILDREN. DO NOT EXCEED RECOMMENDED DOSE. When using nutritional supplements, please consult with your physician if you are undergoing treatment for a medical condition or if you are pregnant or lactating.